Welcome to the December Beautiful World Tour, brought to you by Flourishes! Each month the team presents a themed blog hop, hosted by our group of international designers... we are literally spread out all over the globe! At the heart of our projects is the idea of truly showcasing beauty in card making – whether it be in a beautifully colored image, a fabulous way to incorporate an embellishment or a new twist on a card layout. If you just happened on the blog hop today because you're a regular reader of my blog, and you'd like to view the entire hop, you can start back at the Flourishes Blog - you'll find a full list of participants there, and all the details you need. This month we've been challenged to showcase the beauty of glass. I thought of the canning jar in the Garden Picks set, and created a little scene with some simple masking. I stamped the center jar first, then masked it and stamped the jar again on either side. After stamping, I removed the mask, and stamped a second impression in the same place without reinking. I stamped the flowers in the center jar, then masked those flowers to stamp bouquets in the other jars, and added a few blooms behind the first bouquet as well. I colored my scene in with Polychromos oil based pencils - it has been a while since I pulled these out and it was fun to color with sharp-pointed pencils after working with brushes and brush markers for so long. I added layer after layer of color until I got the depth of shading that I wanted. Oh my goodness this is absolutely beautiful. Wow! That is truly stunning! What a gorgeous scene you've created. Your colouring is fabulous! 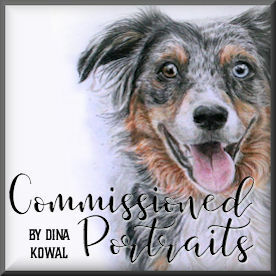 Oh, Dina, this is gorgeous! I love the scene you created with the flowers and the way you layered the ribbon and pearls. BEAUTIFUL! Love your coloring. thanks as always for sharing. 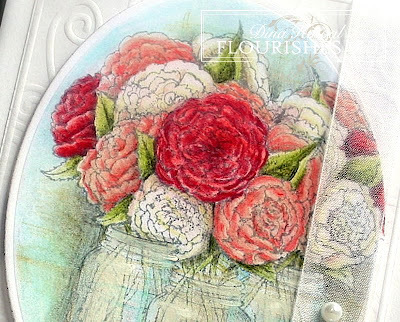 The coloring is amazing, so pretty, and I love that sheer ribbon....adds to the translucent effect of the whole card. Wow this is gorgeous, beautiful coloring and I love the 3-D look! Beautiful coloring--I like how you painted the jars. OH girl...this is amazing. The depth to all of the flower jars is stunning. Gorgeous work! I love the feeling of abundance! GASP! Gorgeous artwork! 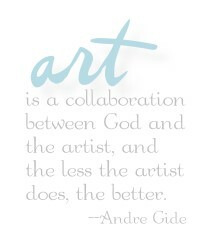 God has blessed you w/some amazing talent! I purchased this set during Black Friday so you've given me some creative inspiration! Goodness me! Dina that is one of the most stunning cards I have ever seen! I love all the detail you put into the canning jars - so reflective and beautiful! Stunning blooms too! This is just an amazingly beautiful card! It should be framed & hung on the wall! Your coloring is just beyond awesome as well! This is absolutely stunning. I would have to frame it and hang it in my craft room. Wow wow WOW... every month you amaze me. I just love that you colour these images with everything but Copics, because it gives them such a different look... so SO beautiful!! You really put a lot of time and effort into this and it shows. Nicely done! You did some awsome coloring here, and I just LOVE that stamp! Just stunning! And even from the photo, I can see the reflective quality of the jars. Wow! wow... what a gorgeous card! the coloring is outstanding! Wow, what fabulous masking! This looks amazing! Gorgeous! The way you achieved the transparent layering of glass with the double stamping or brilliant, and the coloring is amazing! Ditto to all the comments!